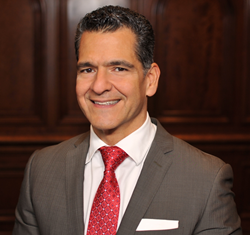 Horizon Blue Cross Blue Shield of New Jersey (Horizon BCBSNJ) announced today that the company’s Board of Directors has elected Carlos A. Medina, Esq. as a member of the board. Mr. Medina is the President of Robinson Aerial Surveys and the Chairman of the Board of the Statewide Hispanic Chamber of Commerce of New Jersey. “As a small business operator, I am keenly aware of the challenges organizations face in obtaining high quality, affordable health insurance for employees and their families. Horizon is challenging the status quo and putting a focus on reducing costs, improving results and giving patients a more holistic and positive experience through innovative partnerships with doctors and hospitals. Healthcare is undergoing a rapid and revolutionary change and I am looking forward to helping Horizon fulfill its mission to provide excellent and affordable health insurance to as many New Jerseyans as possible,” Mr. Medina concluded. Mr. Medina is a graduate of Rutgers University and Rutgers School of Law. He has previously served on the Boards of the NJ Economic Development Authority, the Hispanic Bar Association of New Jersey, and The Super Bowl 2014 Host Committee Business Connect. He has been a member of the Statewide Hispanic Chamber of Commerce since 2005 and became Chairman in 2012. Under Mr. Medina’s leadership, the organization has nearly doubled its membership becoming the largest Chamber in the State by membership and the pre-eminent voice of the more than 80,000 Hispanic-owned businesses in New Jersey. Horizon Blue Cross Blue Shield of New Jersey, the state’s oldest and largest health insurer is a tax-paying, not-for-profit health service corporation, providing a wide array of medical, dental, and prescription insurance products and services. Horizon BCBSNJ is leading the transformation of health care in New Jersey by working with doctors and hospitals to deliver innovative, patient-centered programs that reward the quality, not quantity, of care patients receive. Learn more at http://www.HorizonBlue.com. Horizon BCBSNJ is an independent licensee of the Blue Cross and Blue Shield Association serving more than 3.8 million members.